The "Cariboo" is described and the finished pattern is illustrated by Dr. F. Boas (1, p. 229, Fig. 1, 3, p. 570, Fig. 525a). It is described, but not figured, by Dr. Haddon (5, p. 216). It is given by Dr. Boas as coming from the Eskimos of Cumberland Sound, Baffin Land, where it is known as Tuktuqdjung = a Cariboo. Second: Bend the right index away from you over the right far index string and over both strings of the right little finger loop and down on the far side of the right far little finger string (Fig. 274); then draw toward you on the near side of the right index both right little finger strings and the right far index string, allowing the right near index string to slip over the knuckle of the index and to the far side of the finger. Now put the right index (still bent and holding the strings on its near side) from below into the thumb loop, by pressing the near side of the bent index toward you against the right far thumb string, and putting the tip down toward you over and on the near side of the right near thumb string (Fig. 275). Pick up, on the far side of the bent right index, this right near thumb string, and lift it and the former near index string up by turning the index away from you and up to its usual position (Fig. 276). 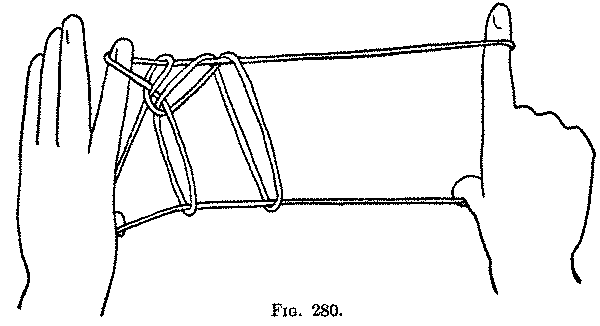 Third: Release the loop from the right thumb (Fig. 277). Fourth: Give the loops on the right index a twist by rotating the index away from you, down on the near side of the little finger loop and then up toward you. Fifth: Put the right thumb from below into the two loops on the right index, and draw the thumb away from the index in order to enlarge the loops. 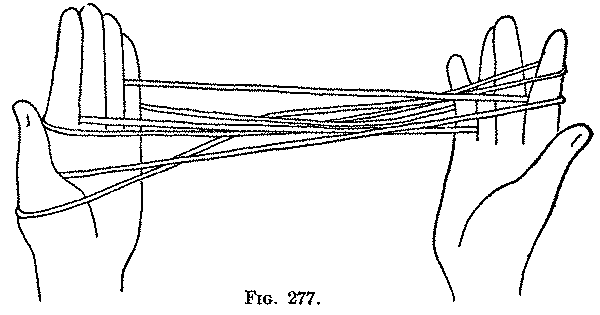 Sixth: With the left thumb and index take the loop from the left index, and pass it from above and away from you through the two loops passing around the right thumb and index (Fig. 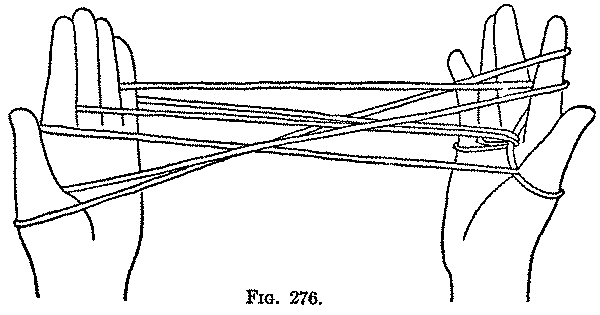 278), without twisting the loop or touching the right little finger loop, and put it back on the left index (Fig. 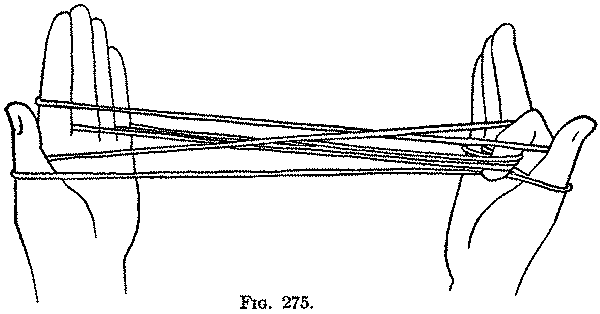 279). 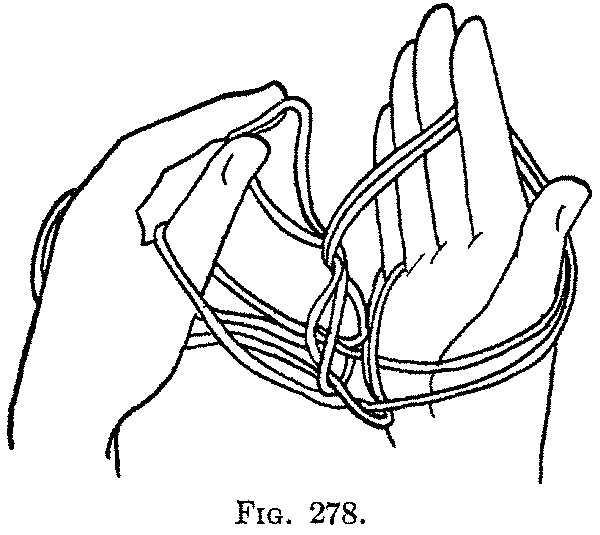 Seventh: Release the loop from the left thumb, and release the loops passing around the right thumb and index, and draw the hands apart; putting the left thumb into the left little finger loop, withdrawing the little finger, and putting the right thumb and index into the right little finger loop, withdrawing the right little finger. Extend the figure between the widely separated thumbs and index fingers (Fig. 280). The finished figure is curious and unsymmetrical, and bears some resemblance to a cariboo with the head and horns directed to the left. The Second and Third movements are peculiar to this figure.